BACKGROUND: Cognitive impairment, highly prevalent in patients with heart failure (HF), increases risk for hospitalization and mortality. 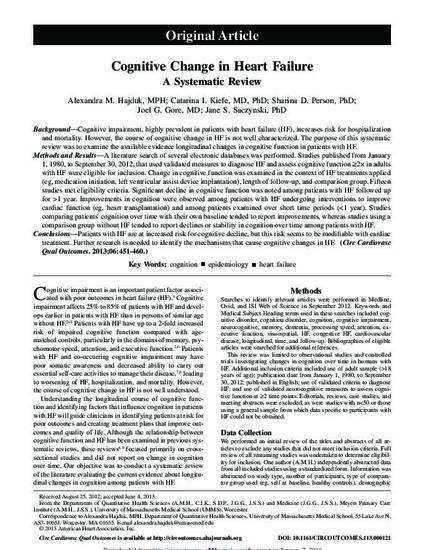 However, the course of cognitive change in HF is not well characterized. The purpose of this systematic review was to examine the available evidence longitudinal changes in cognitive function in patients with HF. METHODS AND RESULTS: A literature search of several electronic databases was performed. Studies published from January 1, 1980, to September 30, 2012, that used validated measures to diagnose HF and assess cognitive function >/=2x in adults with HF were eligible for inclusion. Change in cognitive function was examined in the context of HF treatments applied (eg, medication initiation, left ventricular assist device implantation), length of follow-up, and comparison group. Fifteen studies met eligibility criteria. Significant decline in cognitive function was noted among patients with HF followed up for >1 year. Improvements in cognition were observed among patients with HF undergoing interventions to improve cardiac function (eg, heart transplantation) and among patients examined over short time periods (year). Studies comparing patients' cognition over time with their own baseline tended to report improvements, whereas studies using a comparison group without HF tended to report declines or stability in cognition over time among patients with HF. CONCLUSIONS: Patients with HF are at increased risk for cognitive decline, but this risk seems to be modifiable with cardiac treatment. Further research is needed to identify the mechanisms that cause cognitive changes in HF. First author Alexandra M. Hajduk is a student in the Clinical and Population Health Research (CPHR) program in the Graduate School of Biomedical Sciences (GSBS) at UMass Medical School.